Heidelberg Engineering's SPECTRALIS MultiColor Module Shines at ARVO in Comparisons to Color Fundus Photography | Heidelberg Engineering Inc.
Heidelberg, Germany – Multiple international studies evaluating the sensitivity of SPECTRALIS MultiColor confocal scanning laser ophthalmoscopy versus color fundus photography were presented at the Association for Vision and Research in Ophthalmology (ARVO) 2018 conference in Honolulu, Hawaii. The studies presented at ARVO reported better sensitivity and visualization of a number of pathologies using the SPECTRALIS MultiColor Module in comparison to color fundus photography. The SPECTRALIS MultiColor Module differs from color fundus photography in that it uses three laser wavelengths simultaneously and a 5μm/pixel resolution to provide diagnostic images that show distinct structures at different depths within the retina and clearer images than conventional color fundus photography. Amit Meshi, UCSD, San Diego, California, USA, et al.1 compared retinal pathology visualization and detection between the SPECTRALIS MultiColor Module, Optos P200 and Topcon TRC-50DX. The authors concluded that while the overall detection rate of retinal pathology was similar across all three devices, a larger area of macular involvement and significantly better epiretinal membrane (ERM) visualization were noted on the SPECTRALIS MultiColor images. A comparison of the three technologies is shown in figure 1. Find out more about the MultiColor Module for SPECTRALIS at www.spectralis-multicolor.com. Amit Meshi, UCSD, San Diego, California, USA, et al. Comparison of retinal pathology visualization in multi-spectral scanning laser imaging. Abstract Number: 1501 – C0342, ARVO 2018. Ryoh Funatsu, Kagoshima University, Kagoshima-shi, Japan, et al. Comparison of color fundoscopy and SPECTRALIS MultiColor on detection of epiretinal membrane and relationship between ERM findings and metamorphopsia. Posterboard Number: C0111, ARVO 2018. Obaid Kousha, Ninewells Hospital, London, et al. 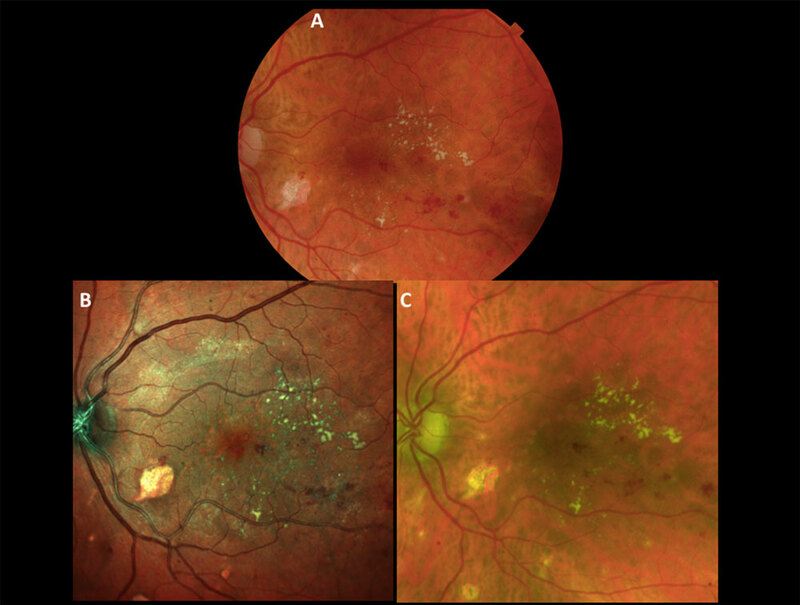 Diabetic maculopathy: Multicolor and SD-OCT versus fundus photography. Posterboard Number: C0111, ARVO 2018. Figure 1. Images of the same eye taken using A: Topcon TRC-50DX, B: SPECTRALIS MultiColor Module, C: Optos P200. (Amit Meshi, et al. Comparison of retinal pathology visualization in multi-spectral scanning laser imaging. #1501, ARVO, 2018).